I've been looking for a simple, general non-fiction challenge. I can't find one, so I decided to host my own. I am very much a fiction reader, but I did pick up several non-fiction books last year and I mostly enjoyed them. I need a little push to keep reading them, and I thought some of you might as well. 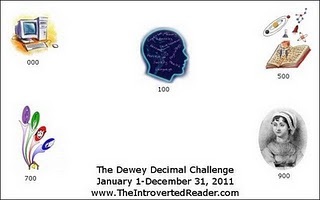 So here's my Dewey Decimal Challenge. This challenge will last from January 1 to December 31, 2011. I really was not going to sign up for any more challenges, but when I came across Jen's non-fiction challenge, I knew that I could not pass this one up! I've got a number of books on my shelf currently that I've been wanting to read that fit this category, so why not?!? I'm going to go with the Master level of 4 books. I'm sure you'll achieve it, Tif. I read a lot of non-fiction anyway, in 2010 I read 29 non-fiction books out of 73, so nearly 40%, but that's because for the past two years I've challenged myself to always have a non-fic book on the go as well as a fiction book, previously I only used to read one book at a time, so that was often only going to be fiction. It worked so well I'll always do that, now. Tracy . . . That's a good idea! I'm reading a chunkster this month and may need some breaks. I may try this! I was reading a non-fiction book at bedtime for a while and that worked pretty well for me. I still enjoyed it but I didn't have to worry too much about getting to a good part that was going to keep me up all night! I need to start doing that again. Introverted Jen . . . I am very excited for this challenge! I actually just picked up a non-fiction audio tonight at the library! !